A dramedy with a fanfic premise: what if Mr. and Mrs. Smith had stayed married and kept working for different sides after learning each other's secrets? 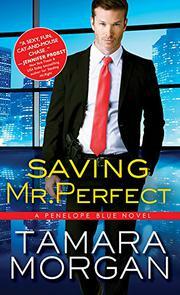 In the second Penelope Blue novel, Morgan (Stealing Mr. Right, 2017, etc.) brings back her jewel-thief heroine who is resisting criminal temptation because of a promise to her husband, FBI agent and all-American good guy Grant Emerson. But despite their passionate attraction and the thrill of one-upmanship that still marks their marriage, Penelope is missing her light-fingered past with her team of fellow thieving misfits. In the meantime, Grant is overworked and coping with another (double?) agent who seems obsessed with taking over his life and dreams—and maybe his wife. There’s also a copycat thief on the loose, so a bored Penelope lands herself smack in the middle of the investigation. Add in some amoral family members and Grant’s eccentric and deadly co-workers, and you have a recipe for rom-com mayhem. While less intricately structured and absorbing than the dynamic first novel in the series, this one fleshes out the couple’s professional and personal relationships and provides some needed point of view from Grant’s perspective. The mystery feels like a MacGuffin, and the red herrings are visible from a mile away, but there’s just enough to keep the plot humming along. The flawed heroine might trigger the eye-roll impulse for some readers, especially in the last third of the story. If you like pointed banter and characters that are just on the edge of functional, à la those in the novels of Jennifer Crusie or Kristan Higgins, this book will keep you occupied for a couple of afternoons.